More than a famous athlete, more than a brilliant scientist, more even than the nation's highest government official, a teacher can wield enormous infulence--because a teacher can truly change lives. Nearly every man and woman today can recall special teachers, those educators whose encouragement or exhortation made the students more than they ever believed they could be. 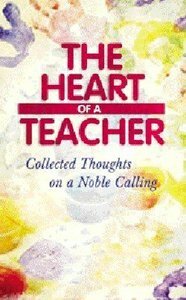 This book honors those individuals who pursue teaching not only as a career, but as a calling from God. Through Scriptures, quotations, and true-to-life stories, this book illustrates the power of purposeful teaching--and will energize educators in whatever circumstances they find themselves. Everyone needs a little recognition now and then, and teachers are no exception. For all the knowledge they've imparted, for all the lives they've touched, this book offers a well-deserved "thank you." About "The Heart of a Teacher"
Veerman is the owner of The Livingstone Corp., a company devoted to helping Christians and Christian organizations improve ministry effectiveness. He currently presents Understanding Your Teenager seminars across the country.